Congressman Lee Zeldin has been re-elected to a third term in the U.S. House of Representatives. Mr. Zeldin, a Republican who bet on the popularity of President Donald Trump in the East End’s First Congressional District, staunchly supporting the president on many domestic and foreign policy issues, took home 52.47 percent of the vote. Democratic challenger Perry Gershon took home 46.41 percent. “In Congress, I will continue working to advance my New Era of American Strength agenda to protect America’s security at home and abroad, help grow our economy, support our veterans and first responders, improve the quality of education, repair our nation’s infrastructure, improve healthcare, and safeguard our environment,” said Mr. Zeldin in a statement after his victory. In 2016, Mr. Zeldin took home 58.22 percent of the vote, or 188,499 votes, while Democratic challenger Anna Throne-Holst took home 41.78 percent of the vote. Mr. Zeldin’s initial victory, in the midterm election of 2014, saw him taking home 94,035 votes against former Rep. Tim Bishop, who won 78,722 votes, a 54.43 to 45.47 percent victory. In 2014, 172,757 votes for U.S. Representative were cast, out of 442,772 registered voters. This year, 246,714 voters have cast ballots that have been counted as of early Wednesday morning. South Fork State Assemblyman Fred Thiele easily bested his opponent, Patrick O’Connor, in an 59.8 to 40.2 percent vote. Mr. Thiele has been the South Fork’s state assemblyman since 1995. State Senator Kenneth P. LaValle, a Republican, was easily elected to his 21st term with 58.3 percent of the vote. His Democratic challenger, Gregory Fischer, took home 41.6 percent. On the North Fork, incumbent Republican State Assemblyman Anthony Palumbo beat challenger Rona Smith by a wide margin, with 60.2 percent of the vote to Ms. Smith’s 39.8 percent. Mr. Palumbo, who took up the unexpired term of former Assemblyman Dan Losquadro when Mr. Losquadro became Brookhaven Highway Superintendent in 2013, is a New Suffolk attorney and former Suffolk County assistant district attorney, who currently practices law with offices in Mattituck. Ms. Smith serves as Chair of Southold Town’s Housing Advisory Commission and Economic Development Committee, and is Vice-Chair of the Southold Local Development Corporation. 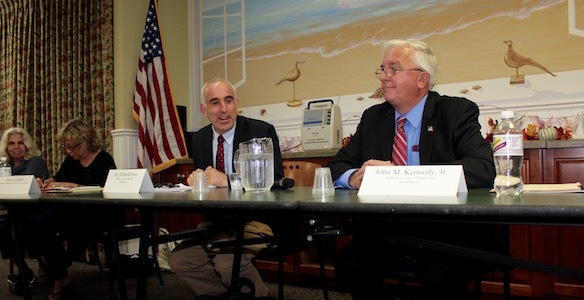 Democratic Southampton Town Supervisor Jay Schneiderman’s was unsuccessful in his bid to beat incumbent Republican Suffolk County Comptroller John M. Kennedy, who declared victory on election night. 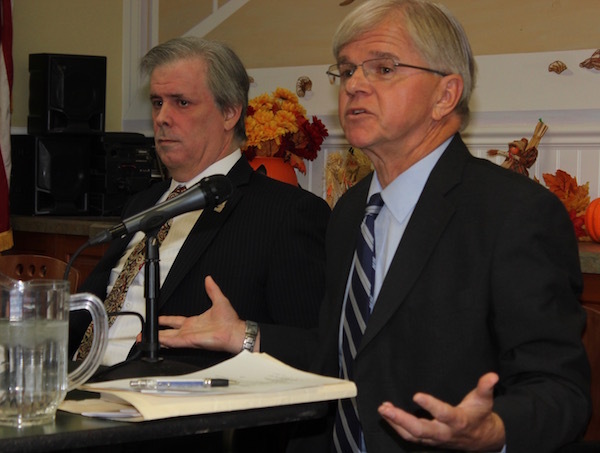 Mr. Kennedy, like Mr. Schneiderman, is a former Suffolk County Legislator, who has been comptroller since 2014. Mr. Kennedy took home 50.1 percent of the vote, while Mr. Schneiderman took home 49.1 percent. On Thursday, Nov. 8, Mr. Schneiderman announced that he will not concede the race until absentee ballots are counted. According to a press release issued by Mr. Schneiderman’s campaign on Thursday, the Suffolk County Board of Elections has not yet counted around 30,000 absentee ballot votes. Mr. Kennedy currently leads Mr. Schneiderman by 8,623 votes, out of a total of 484,757 votes cast on election day. Mr. Schneiderman said that the majority of absentee ballots were from registered Democrats. 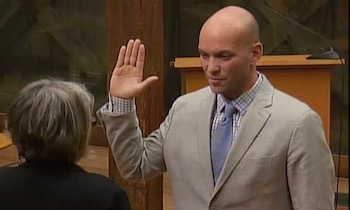 David Lys takes the oath of office Jan. 19. In East Hampton, incumbent Democratic Town Councilman David Lys trounced his Republican opponent, Manny Vilar, in a special election to hold on to his town board seat. Mr. Lys was appointed to fill out the year on the town board this past winter after former Councilman Peter Van Scoyoc was elected Town Supervisor. Mr. Vilar had run against Mr. Van Scoyoc for Supervisor in 2017.